Two player games are quite popular now, which is a wonderful virtual way to spend time with your best pal on your iOS devices. But all two player games are not equally handy and interesting and 2-players game for android users and iOS users are often different from each other for running on different platforms. However, the most interesting part of these 2-player games is its varieties. Starting from vocabulary and word making challenge, there are fun games, farm games, racing games, drawing games, fighting games and many more for your group fun with besties. We have surveyed the market and we have found the best two player games for iOS users so that you can enjoy without the hassle of online search for finding the best 2-player games for iPhone and iPad. Heads Up is an entertaining game with forty themed decks. In this game you have to guess the word hinted on the card. The word can be related to anything like a popular song, a movie’s name, a celebrity names, sports, etc. Not only you can play the game in 2-player mode on iOS devices, but also you can play this game online with more than 10 players or even 100 players at a time. You can capture video-shots of your played game for watching later. 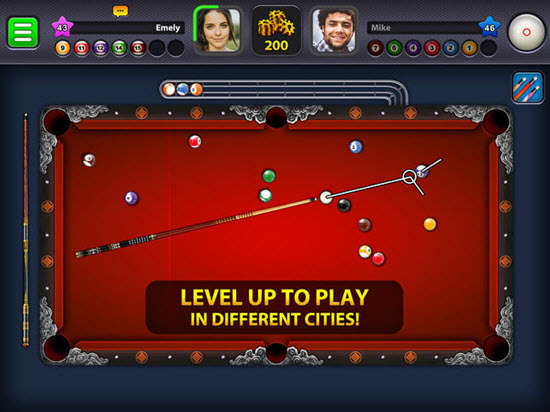 If you love to play pool in your real life, this virtual pool game will be a real entertainer at your fingertips. You can play one-to-one or you may join a tournament to compete for a trophy. You can use your Facebook profile and import contacts to ask your friends to play this ball-pool game. 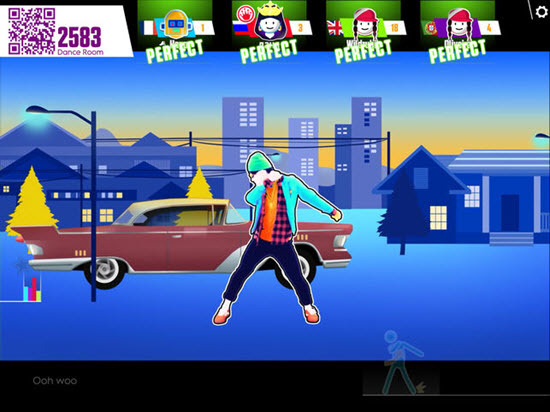 If you love partying and dancing, and will take interest in learning new dancing steps, the multiplayer game Just Dance Now on your iOS device will be a great source of long-term entertainment. You can play it globally and you will get to play the game with 10, 100 and even 1000 players and dance with more than 300 awesome songs. You can create your personal playlist. You need to earn coins while playing the game to unlock new songs, for every month new songs are added to the song inventory. Learning and sharing the right spelling is a pleasant challenge for a large number of people worldwide. The two player game Hangman thus enjoys great global popularity on iPhone and iPad. One of the vital advantages about playing the game is its entertaining dual mode. It can be played in single player mode as well as double player mode. In the single player mode your iOS device will be your invisible rival to play the game and the game design is based on classroom-board-like interface. You can select your level from easy, to standard, or hard, as well as slect various categories like animals, food, geography, holidays, etc. for playing spelling challenge. 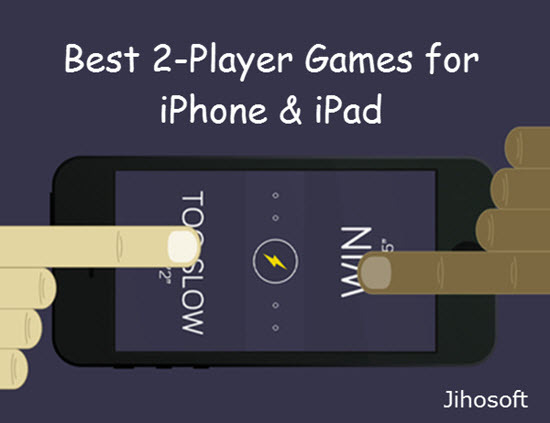 It is a challenging 2 player’s game for those who have good reflex on iPhone and iPad. By playing the game you will get to test your reaction speed. One has to play the role of attacker and the other will act as the defender. The player who gets the first 10 point will be decided as the winner. 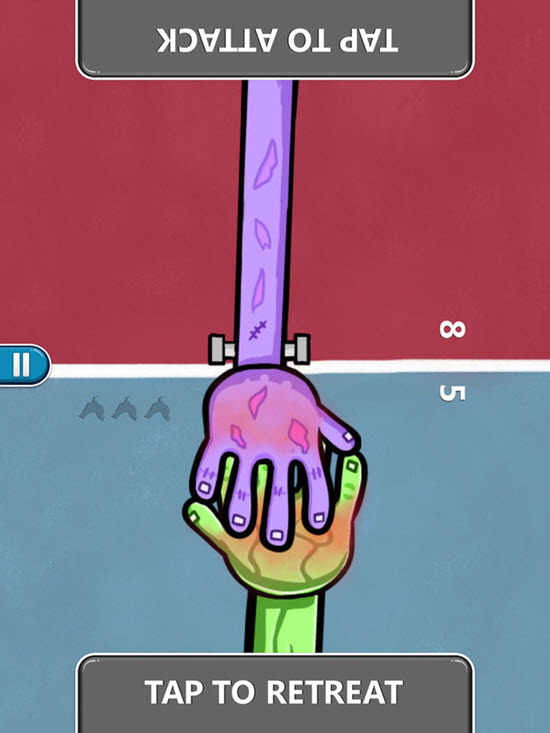 You can select different types of hands to play with. This 2 player game is an interesting one where you will take part in a science fiction. The game, besides its 2-player mode, is available in multiplayer mode as well. 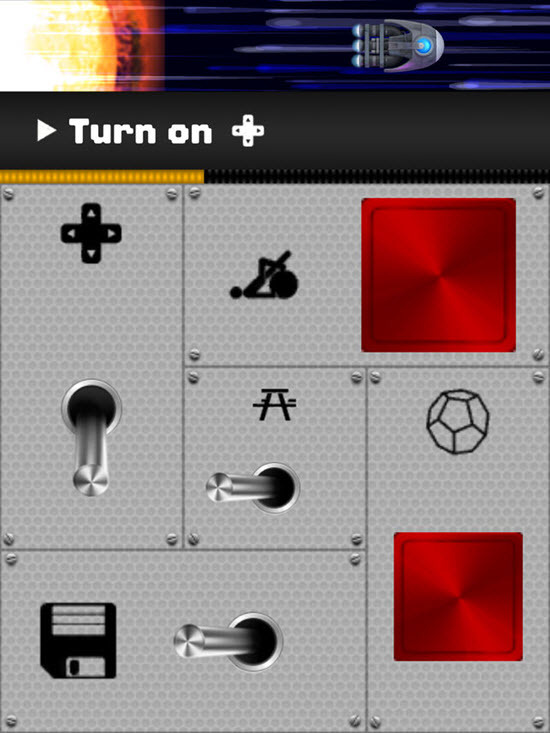 You have to take control on the control panel to access dials, switches, and buttons for game control points, which is important for the gaming control. It is a team-game although you can play it in two player mode. You need to coordinate virtually between your team mates in order to track, follow, and execute the instructions to continue the game successfully. 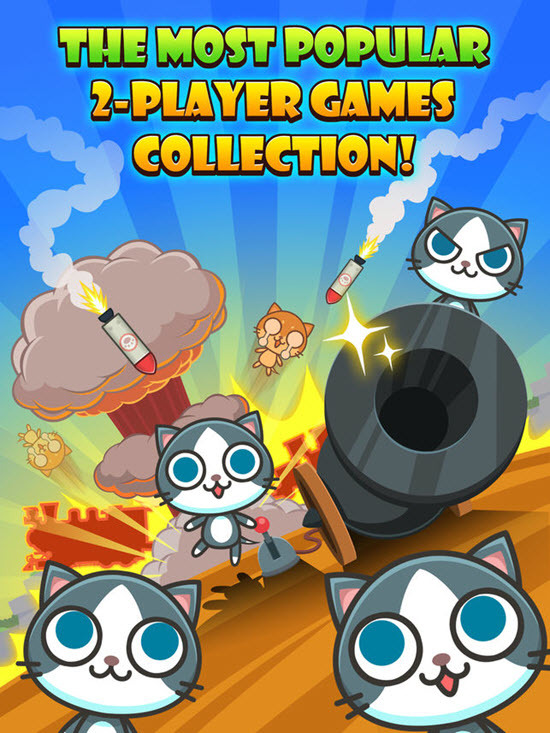 Cats Carnival is one of the most popular two player mode game on iPhone and iPad. There are many small games within this game, which will keep you amused and intrigued with its tweaks and twists. There are many challenging levels which are the prime attraction of this online Cat game. Besides its 2-player mode version, it is available in one player mode also. If you will love the game, you may upgrade it to its pro version, which will cost you only $1.99; this advanced version will let you to play all the games it has in its gaming contour. 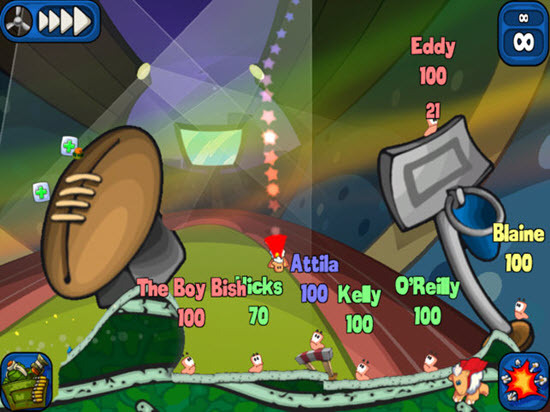 Worms 2: Armageddon has become quite popular these days because of its interesting and stimulating game play. Here you will get to play 16 interesting and different games on iPhone and iPad. The game is built with auto match feature, using which you may find new online friends to play this 2-player game. Besides you play with lethal weapons, you can customize your entire game play, which is an added fun for playing it. There is another privilege to play this IOS game. It has a practice mode for the beginners so that you can improvise your skill before you plunge into the main game flow. 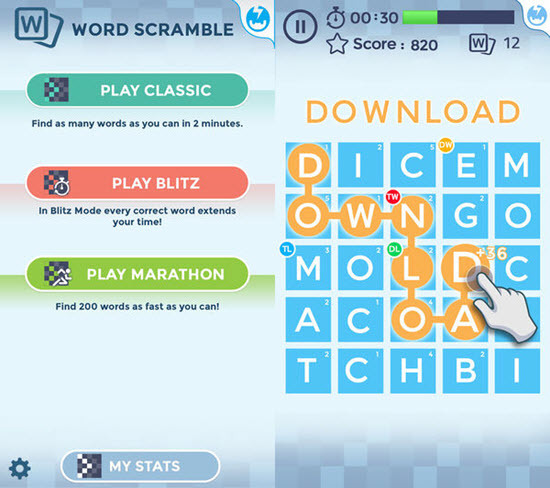 Word scramble is a real pleasure for playing 2 players games virtually on iPhone and iPad. 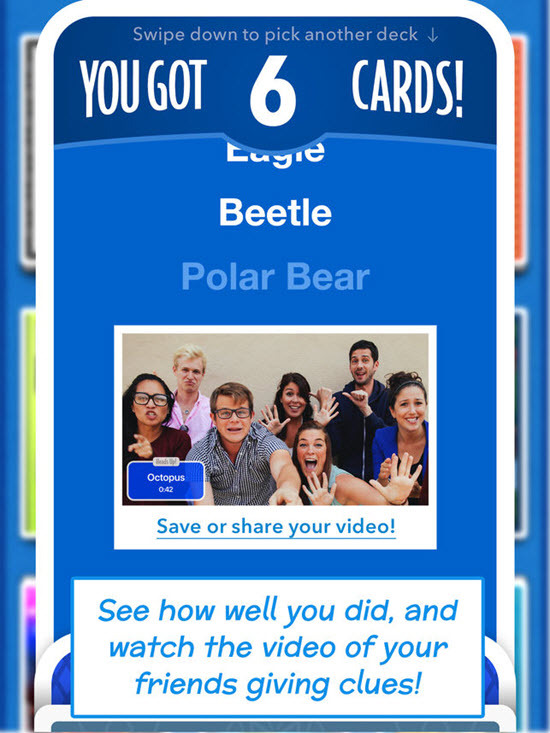 Your challenge is to find a word from the jumbled letters by swipe or slide the screen between the letters. More you win, you can accumulate more scores and trophies in your gaming account. The game can be played in three modes: Play classic, blitz, and marathon. Play classic mode will allow you to search multiple words you can find within 2 minutes time frame. Blitz mode will ask you to spell correctly and quickly. Marathon has no time frame and you can find cluster of words at a time. 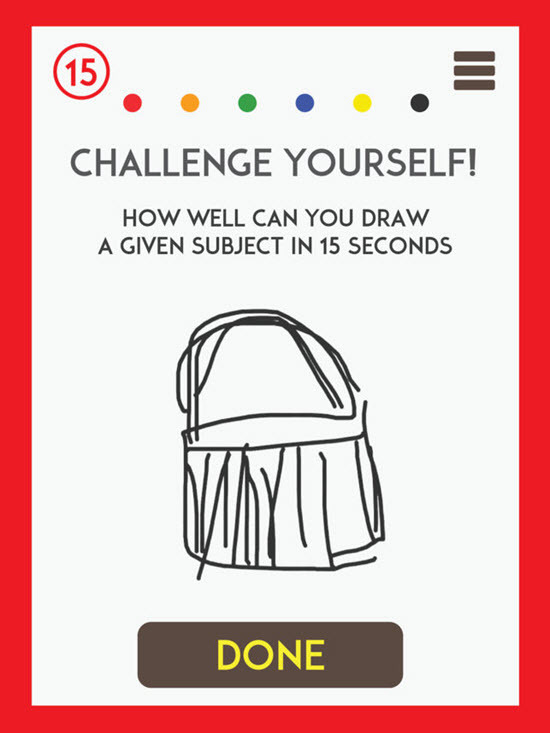 This 2 player-iOS game is for the drawing pros. It’s perfect for a party, a get together, or simply for passing time between two friends or more, in an entertaining mode. The game play is simple. The first player is given a word to draw within a stipulated time, and then other players have to construe and replicate that image. The last/second player has to guess the word and he can nominate the player who played good in that round. You can customize your game by adding themes like Star war, Pokemon, Big screen, etc. Simply watch ads to upgrade your game version or buy it by in-app purchase. These are the globally popular 2-player games for iOS devices you can play with pleasure and fun. These games are widely appreciated for their uniqueness, user-friendliness, as well as for their clean interfaces. Let us know which one of these games you have liked so far? Have we missed a game to add in this list of great 2-player games on iOS? Let us know your preference, as well as share with us your questions or other suggestions by commenting below.